Both BMW and Ducati recently demonstrated car-PTW interoperability using the C-V2X platform that, with each passing week, seems to build momentum. On July 11, The 5G Automotive Association (5GAA) staged what it described as the first European demonstration of C-V2X functionality across multiple brands. The demo included vehicles from Ford, Peugot, and BMW -- and pointedly included a BMW scooter. The 5GAA's demo included this C-V2X equipped BMW C-Evolution scooter. The technology on display was developed by Qualcomm and Savari, and the demonstration included V2V, V2I, and vehicle-to-network (V2N) capabilities. The very next day, Audi demonstrated C-V2X interoperability between autos and motorcycles. That demonstration featured Audi Q7 and Audi A4 road vehicles, as well as a Ducati Multistrada 1200 Enduro equipped with Ericsson C-V2X hardware based on a Qualcomm 9150 C-V2X chipset. 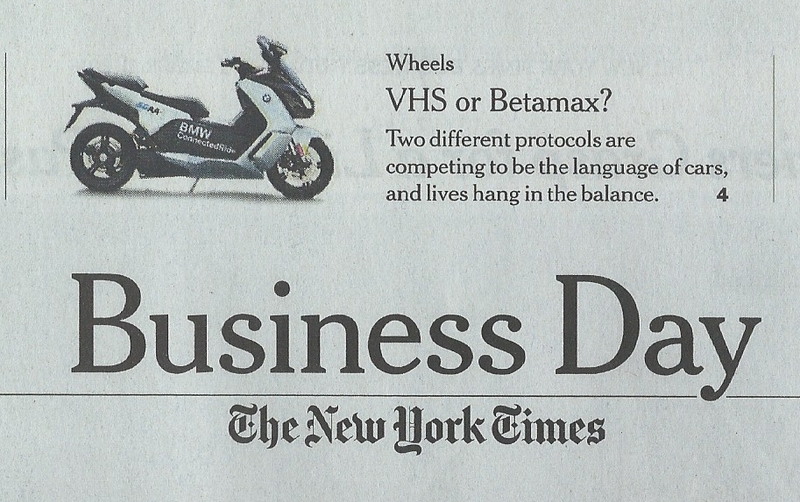 The inclusion of BMW's scooter and Ducati's motorcycle are somewhat heartening. They may have been included in these demos as tokens of interoperability, but since motorcyclists are about 15x as vulnerable as car drivers, we'll benefit more than anyone from such V2V safety systems. One hopes this driver's not relying on C-V2X warnings to alert him to a motorcyclist in plain sight, but here at HAVstory, we'll take all the PTW inclusion we can get! As of right now, these are demos only; I don't know of any PTW manufacturer with a concrete plan to build in V2V capability. I recently discussed a range of Advanced Rider Assistance Systems (ARAS) with Ducati engineers. While they realize V2V safety systems will be increasingly available in cars (and while they're personally convinced of the safety benefits V2V offers riders) they told me there was no specific timeline to take V2X capability from demonstration to production. Motorcycle makers, even more than automakers, seem determined to wait and see whether the 5G C-V2X standard will supplant the nearly 20 year-old, proven-but-barely-deployed DSRC standard. Part Two: Could this help motorcycling?